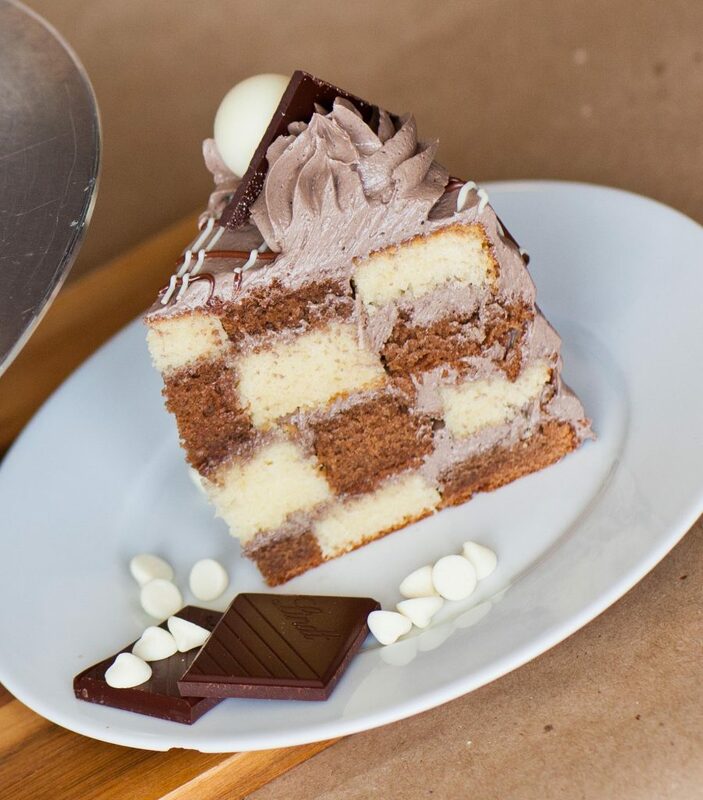 Have you ever seen a checkered cake and wondered how they do it? Well, it’s actually quite easy and I’ll show you just how to make this cake recipe at home! 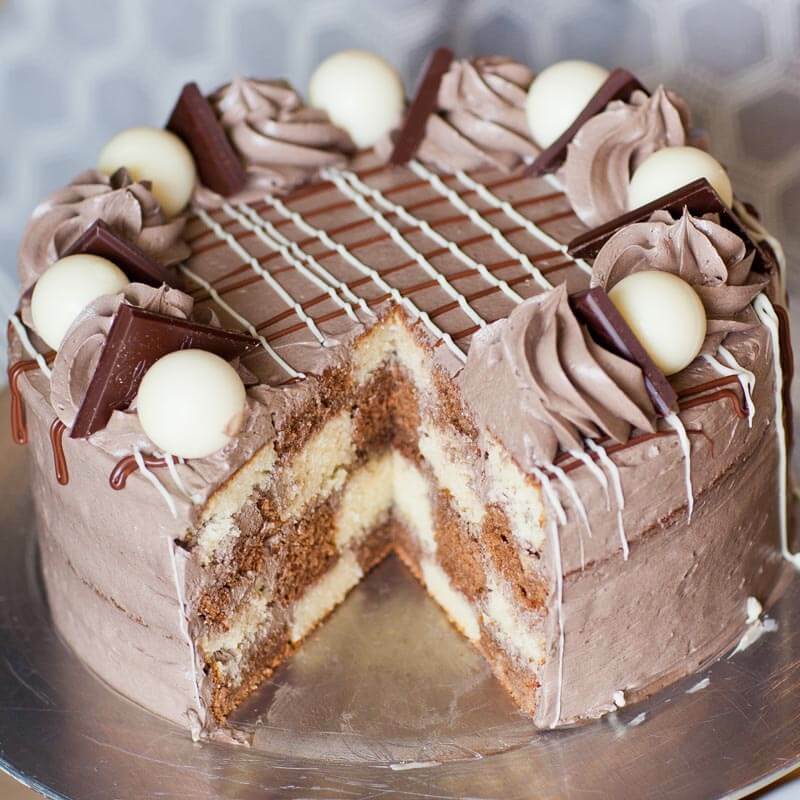 My Triple Chocolate Checkered Cake takes chocolate cakes to a new level of decadence! It’s made with alternating layers of moist and tender dark and white chocolate cake layers and frosted with a dark chocolate frosting. It’s so much fun to make and even more fun to eat! I always wondered how they make checkered cakes and thought there must be some magic process! In fact, it’s super easy! All you’ll need is two vanilla cake layers and two chocolate cake layers. I make the chocolate cake layers with loads of real chocolate, which makes them very moist but delicate. I recommend waiting for the cake layers to cool completely and allow them to rest for a few hours, or overnight, for easier handling. Just use a set of round cookie cutters, or even trace circles on paper then cut using a knife. Alternate the pieces of dark and white chocolate cake until each layer unique. To hold all that cake together, I recommend using a chocolate buttercream. I have several great recipes on my blog, like my original ‘Chocolate Buttercream Recipe’ or my chocolate ‘French Buttercream Recipe’. Both are great options! This fun checkered cake is the perfect choice for a special celebration! Imagine the look on your friends and family’s faces when you cut into this cake to reveal the inside! I love to garnish the top with a drizzled of melted chocolate, generous dollops of chocolate frosting and a few truffles and chocolate pieces. Check out my recipe for the ‘Perfect Chocolate Cake’ – great for any cake that needs a cake base. And also try this epic ‘Strawberry Tuxedo Cake’ with no-bake cheesecake and loads of strawberries! I love these 8-inch aluminum cake pans by Fat Daddios! Use them with these precut parchment paper rounds. This set of jumbo cake decorating tips has all my favorite tips! Use them with these disposable pastry bags. And no baker’s kitchen is complete without a KitchenAid stand mixer! Preheat oven to 350F. Line 2, 8-inch cake rounds with parchment paper and spray down the sides with baking spray; set aside. Prepare the cake batter. In a large mixing bowl, cream together the softened butter and sugar until light and fluffy. Add the eggs and vanilla and beat again until creamy. In a separate bowl, combine the dry ingredients: flour, baking powder and salt. Stir them together, then add the dry ingredients into the cake batter. Pour in the milk, then whisk everything together by hand, just until combined; don't over-mix the batter. Melt the 1/2 cup white and dark chocolate in the microwave or over a double boiler. Divide the cake batter in half between 2 mixing bowls. Add the melted dark chocolate into one bowl, the melted white chocolate into the second. Mix the chocolate into the cake batter until well combined. Pour the cake batter into the prepared pans. Bake in preheated oven for 40 to 45 minutes, or until a toothpick inserted into the center comes out clean. Allow the cakes to cool slightly into the pans, then invert onto a cooling rack to cool completely. Prepare the chocolate frosting. Place the softened butter into a mixing bowl. Mix on high speed until butter is light and fluffy. Add the vanilla, cocoa powder, heavy cream and 1 cup of confectioner's sugar. Gradually add the remaining sugar while mixing on low speed. Once all of the sugar is added, scrape down sides of the mixing bowl, then mix on high speed for a few minutes until frosting is light and fluffy. Assemble the checkered cake. Split each cake layer in half. Use 6-inch and 2-inch round cookie cutters to cut each layer into 3 pieces. Swap out the center and outer rings; watch video for more details. Assemble the cake with alternating layers, spreading frosting between each layer. Frost the top and sides; smooth down with a flat spatula. Garnish the cake with melted chocolate and chocolate truffles. What about a lighter frosting? Hello …..i tried to make your cake because it looks so delicious but i just couldnt make those layers. When i want to bake them in the oven they come up just as they should but then they fall together again. I tried it 3 times but always the same result …..maybe you can tell me what i made wrong . Hi there! Sorry to hear that! There can be two things going wrong. Please check the expiration date on your baking powder to make sure it’s fresh. The other thing is over mixing. Once you start adding the flour, take extra care to not over mix the batter. If it’s overmixed, it gets heavy and won’t rise like it should. Hope that helps! Is it also possible to put at first the chocolate and then the flour ? …..so you dont have to mix it again . I was really careful when i mixed it …..it is the same like making a bisquit . Yes, you can certainly add the chocolate first, then split the flour in half, too. Hai I love this cake very much. I am going to bake this cake for my sister’s eighteenth birthday. I hope everything will turn out fine! Could you please tell me the measurement of the round cake tin in cm? Is it a 20cm cake tin? I tried this cake twice it tastes amazing. I faced a problem on the first time when I cut each layer into three circles then while moving the circles the cake disintegrated Just a little bit. on the second time the cake disintegrated ALOT almost all of the cake circles. So what can I do to not let this happen next time? When I put the cake to bake, what temperature do I put it to? do you have to add the chocolate, can you substitute cocoa powder? Quick question, does the chocolate have to be dark? Can it be milk chocolate? And follow up question, can I use normal cocoa powder or do I have to use dark cocoa powder? Hi Tatyana, can we put in ice cream inside the cake instead of interchangeable the cake pieces? Will the cake holds the ice cream well? Your cake look very appetizing.